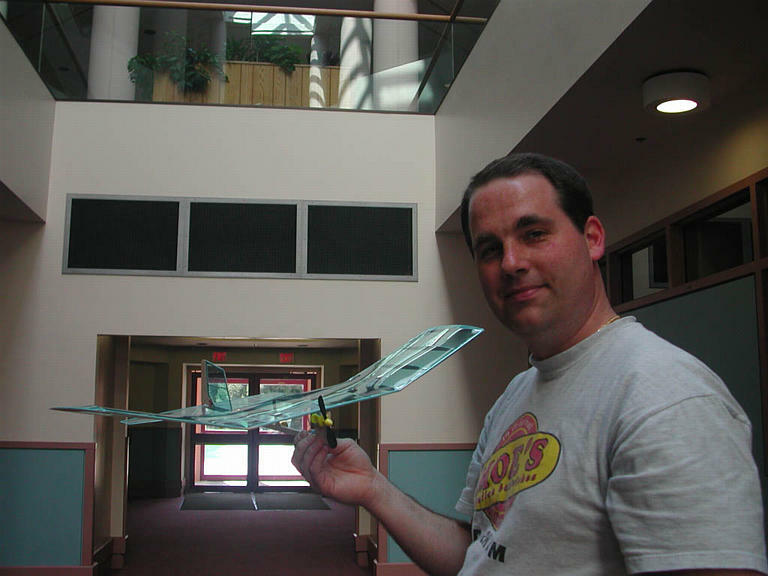 While reading the indoor flight discussion board on rcmicroflight.com I read some information about making an indoor R/C plane under 2 oz. that is controlled and powered exclusively by stuff you can get at Wal-Mart! Well since I had some time I figured why not! Off I went to Wally-World. This page documents my experience. 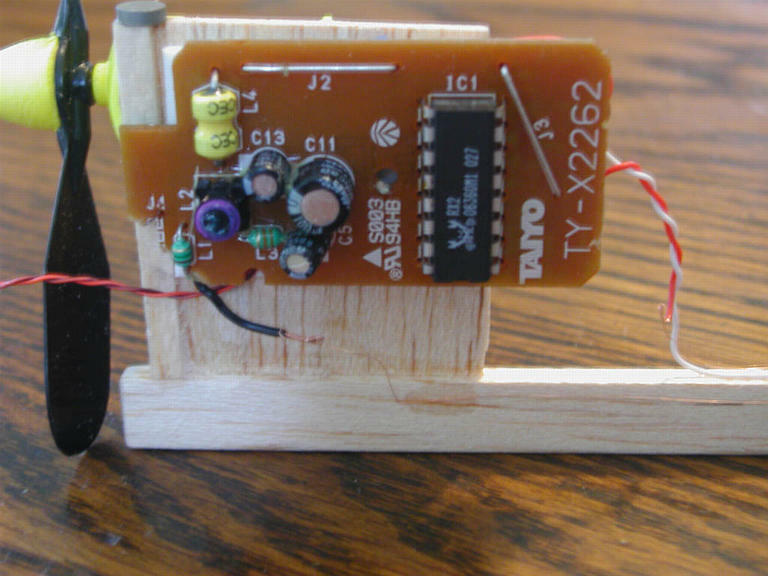 If you have a Wal-Mart and a Radio Shack near you you can get everything you need to do this project (not couting balsa wood) at those two stores and the total cost is less than $50! Better yet is the time investment is not that bad. 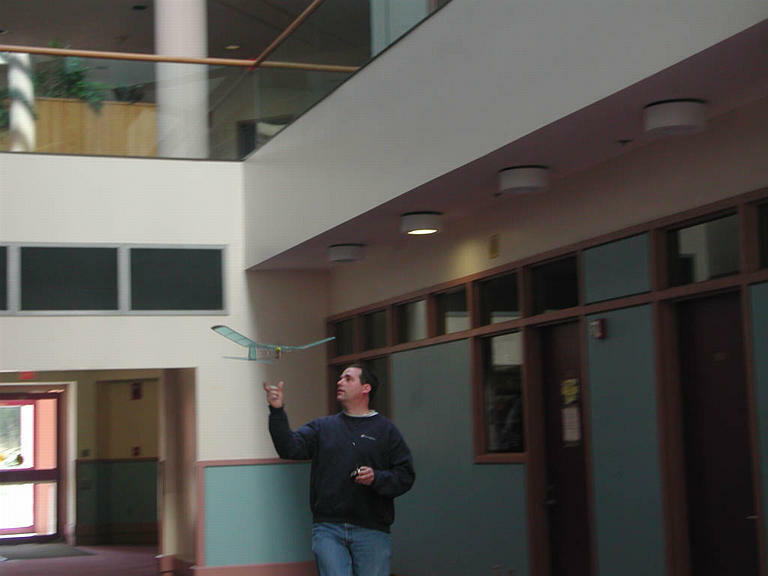 I got the entire project done in 1 weekend without pushing too hard and that includes 3 hours of flight trials. 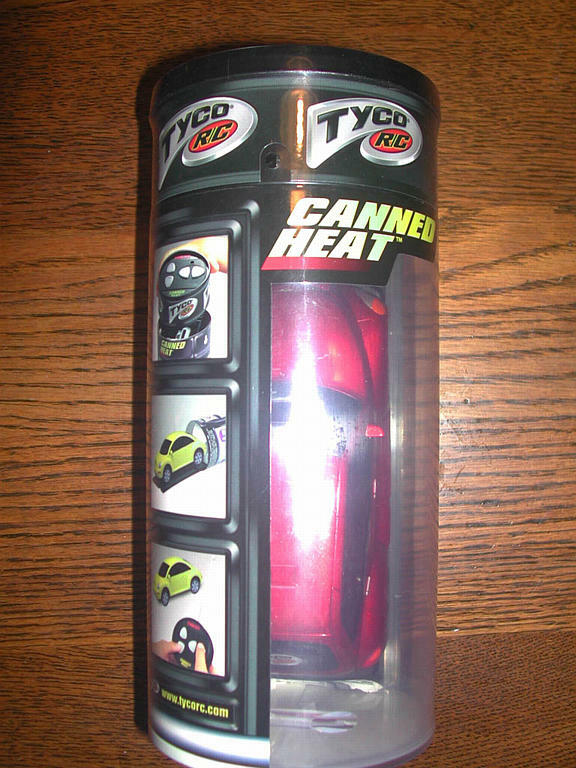 At Wal-Mart (or any toystore) buy 1 TYCO "Canned Heat" R/C car. I picked the PT Cruiser, but it doesn't really matter which one since you'll be dismantling it anyways. 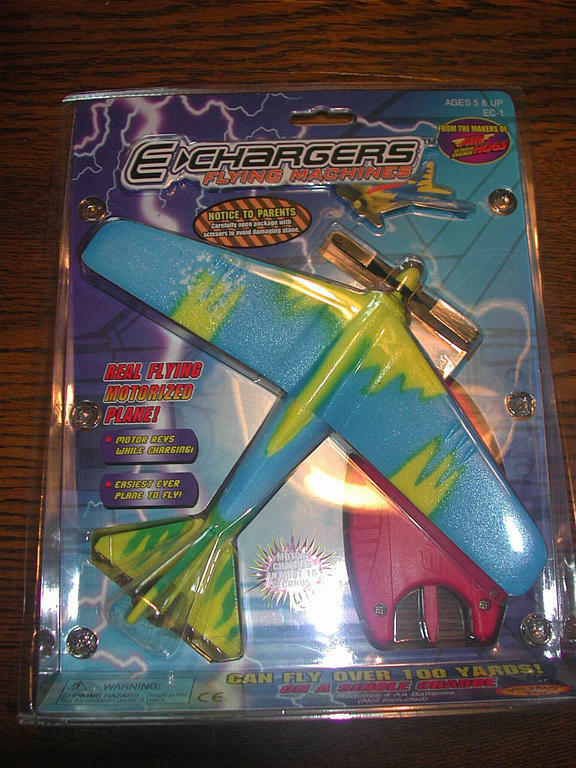 Also get 1 E-Chargers plane, again model doesn't matter. You'll also want some Duracell CR-2 Lithium batteries. These are in the photo department. 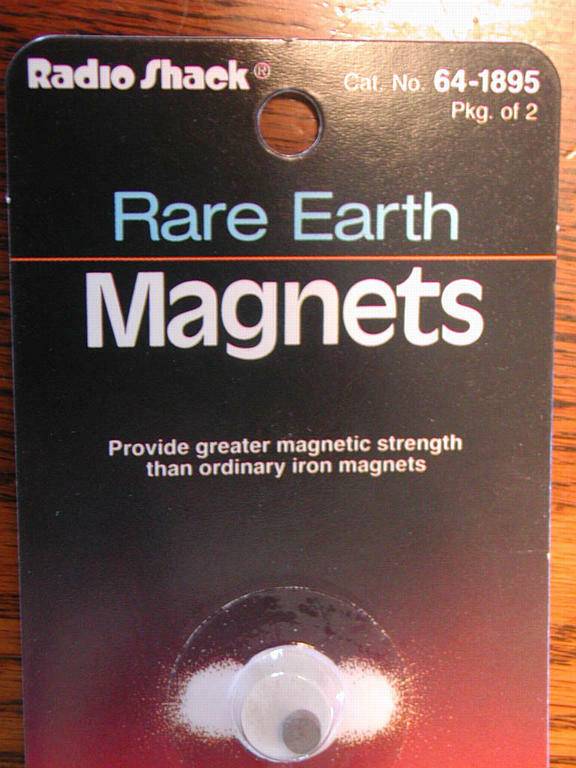 At Radio Shack pick up 1 Heavy Duty Relay (part # 275-206c) and 1 package of Rare Earth Magnets (part # 64-1895). 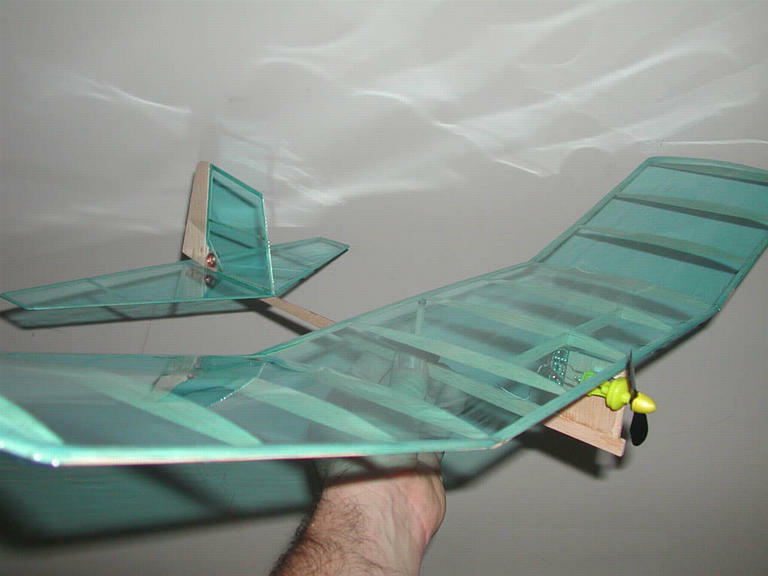 I also bought 2 more packs of these to attach my wing which really improves the ease of attaching a light wing and proved to enable the wing to survive several impacts with colums in my first test flights. 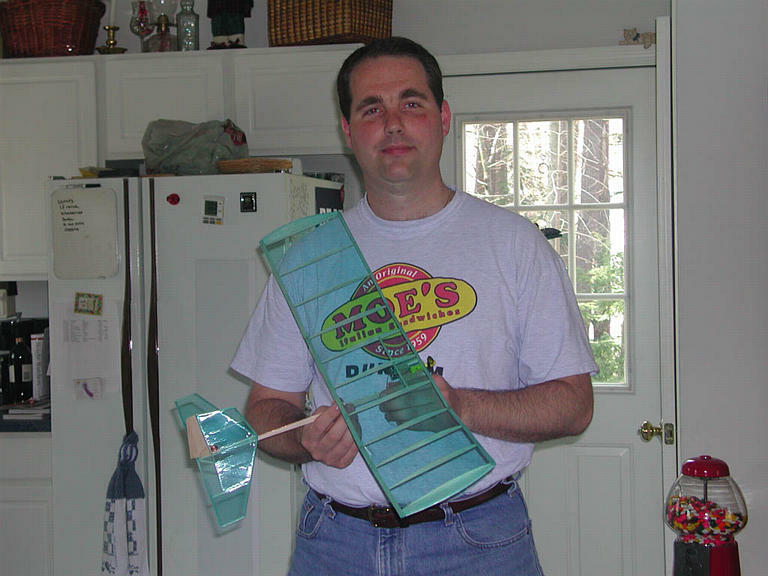 The fuselage of my plane is easy to fix, the wing would take 2 hours to build a new one. I also bought a small SPDT switch to wire to the transmitter's forward button so I wouldn't have to hold the button down all the time and a better antenna. If you don't own a soldier iron you'll want to pick one up, they have a kit for about $8 with solder. When I got home I checked both the E-Charger and the Canned Heat car to make sure they worked before I took them apart. Take apart the car carefully. Note the antenna is on top of the car under the body melted to some pegs. I cut the pegs being careful not to damage the wire inside. 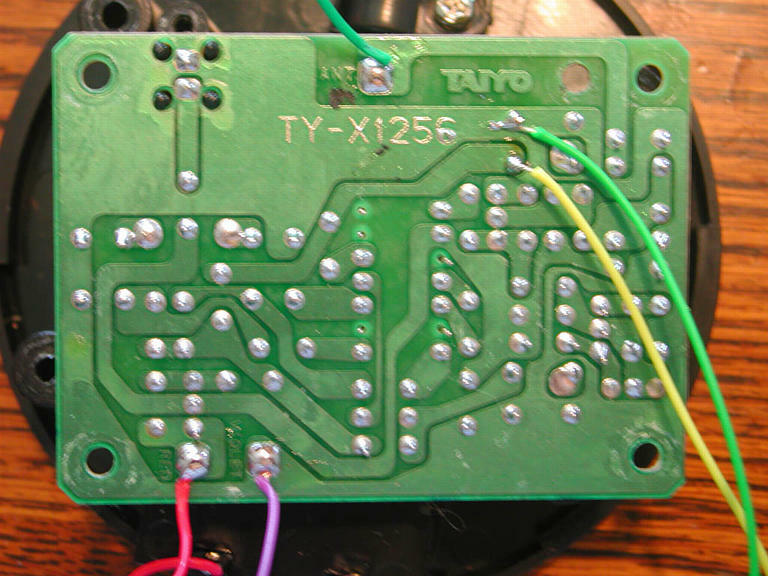 Note which wires go to which components (I took a digital photo) and cut the leads off the motor right at the motor. Cut the leads off the steering coil at the coil. 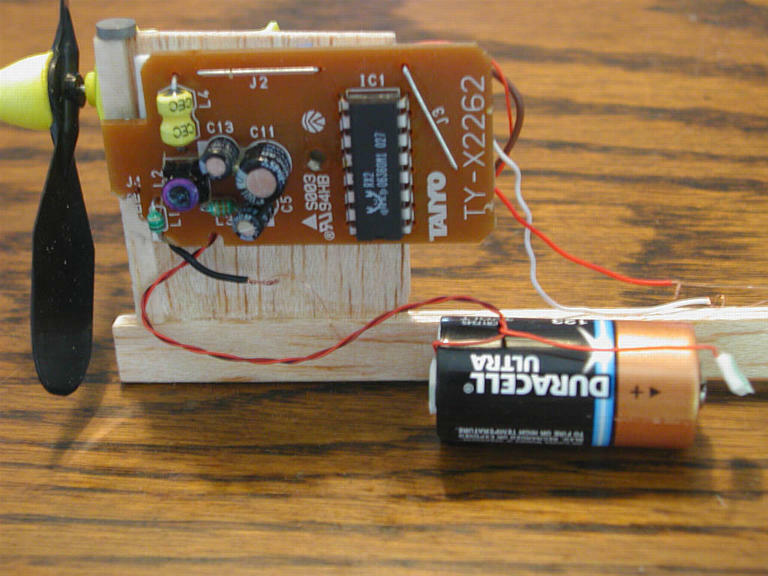 The batteries are attached by a wire on the positive side and the negative battery terminal is attached to the PC board on the other. It's easiest to just de-soldier the negative terminal while the PB board is in the car then remove the board. I tried to pry it out and dinged a corner off the PC board. 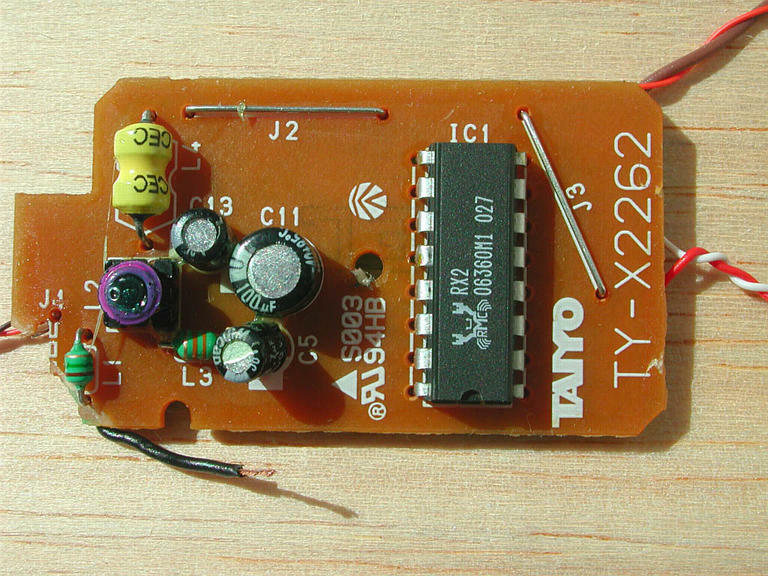 Bruce Abbot of New Zealand has an excellent write up on the receiver which I found helpful. I've also labeled the middle picture above to help. Your receiver may be a bit different so beware. Cut the blue motor lead off short and solder 2 wires to the place the negative battery clip was. One of these will go to your battery (-) and the other to the motor in place of the blue wire. 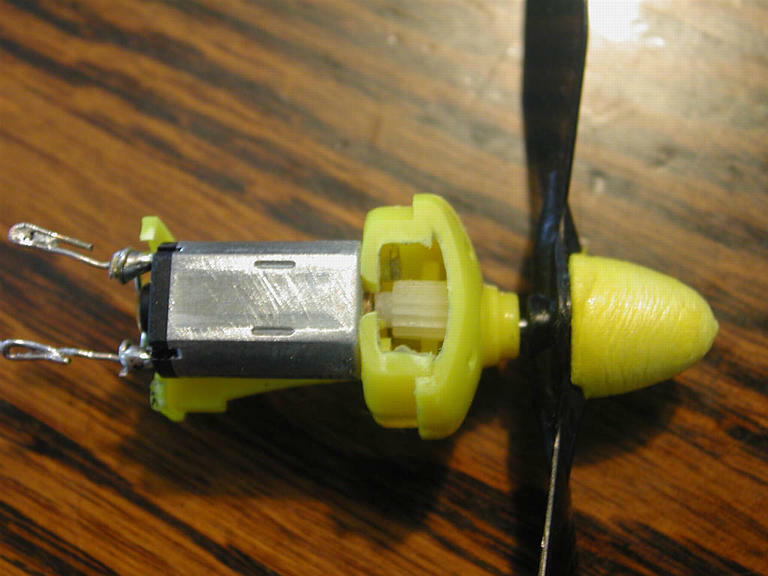 Remove the motor assembly from the E-Chargers plane by cutting away the foam carefully. Once you have the assembly out cut off the large silver capacitor with wire cutters and remove any plastic that held it. File away the cowling flush with the motor. 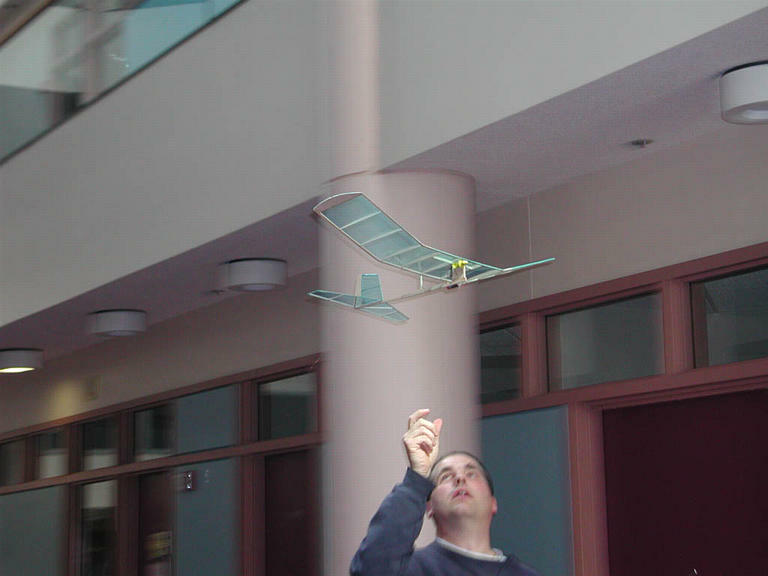 You'll use foam tape to attach the motor to the airframe. 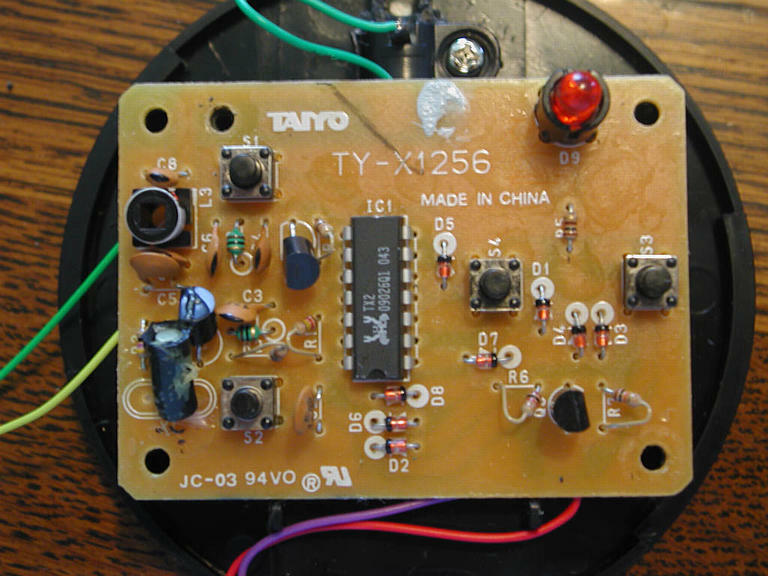 Remove the small capacitor from the car motor and soldier it between the e-charger's terminals, or if you have a spare cap from an ESC you bought use that. 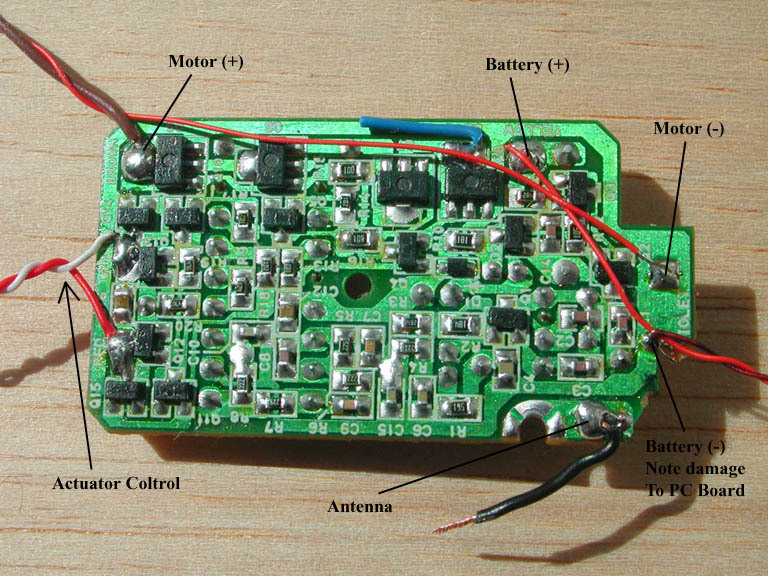 Here is the transmitter. Take it apart and find the up button. Solder some wire to where it connects to the PC board and solder a SPDT switch to the wires. In the picture the yellow and green wires are the ones I added. Drill a hole in the face of the case and mount the switch. This part is tricky to fit so plan accordingly. 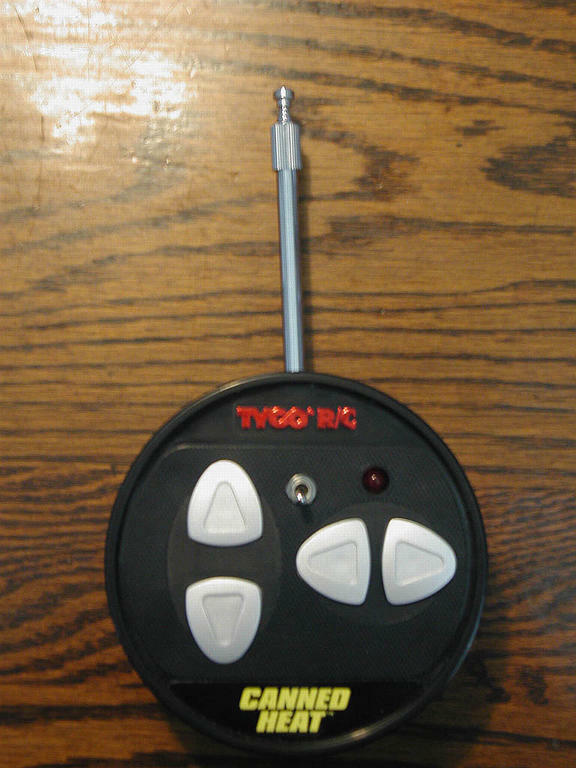 The antenna that comes with the transmitter is a little wimpy so I added a cordless phone antenna from Radio Shack. It's a screw-in fit I just had to open up the hole in the plastic case a little. 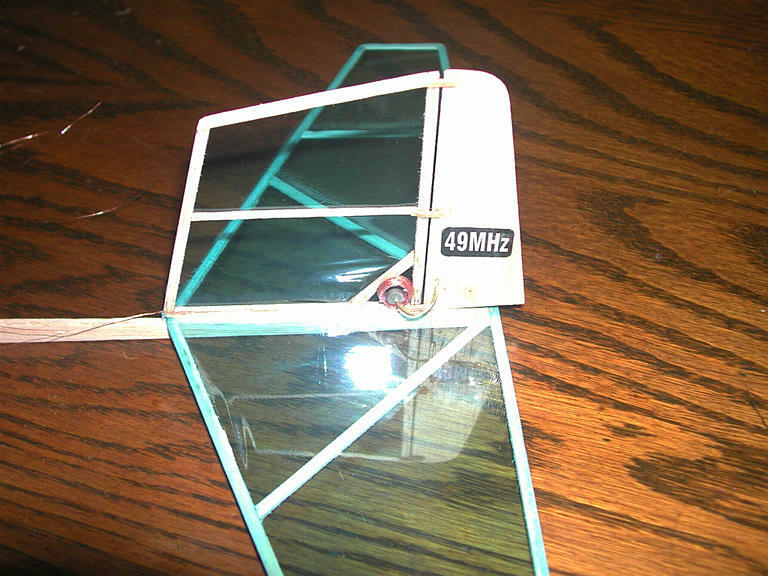 Both of these steps are optional, the transmitter can work fine as purchased. In the car the receiver drives a heavy actuator, much too heavy for micro RC use. 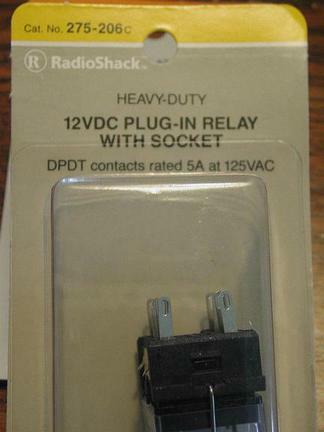 Take apart the Radio Shack relay and remove the coil. It helps to pry apart the metal around the coil. Remove the tape covering the coil, this will give you access to plenty of fine wire to make your coil. 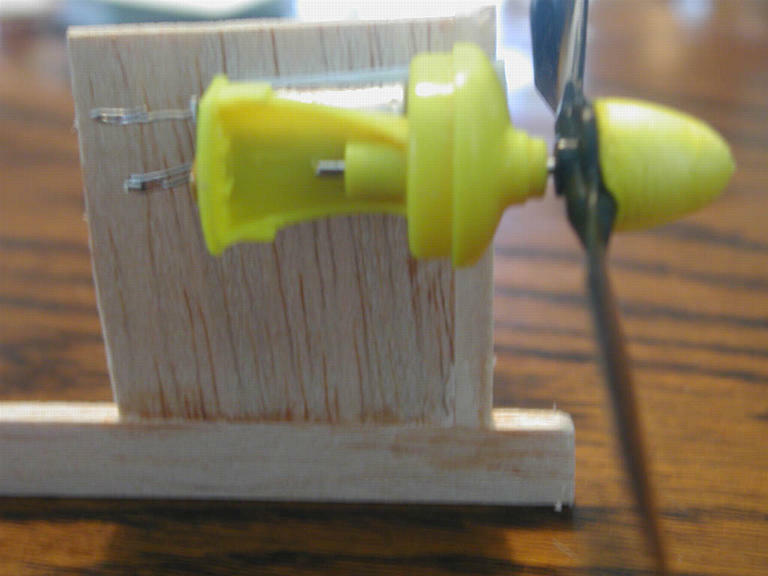 Cover a round pencil with wax paper and start winding the relay wire around the pencil. Make sure to leave plenty (3') of wire to attach to the receiver for each of the coil's leads. I found it helpful to put a little thin CA every 50 wraps or so. My coil was 5mm wide and 3/8" in diameter when finished read a resistance of 16 ohms which is the goal. 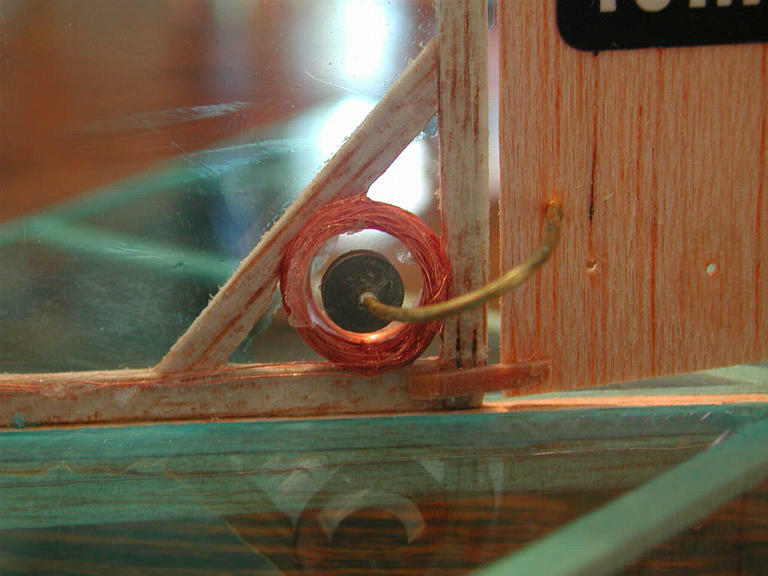 Mount the coil as close to the rudder's hinge point as possible. I need to work a new system to get mine closer but this layout gives around 3/8" of travel to each side on my small rudder which should be plenty. 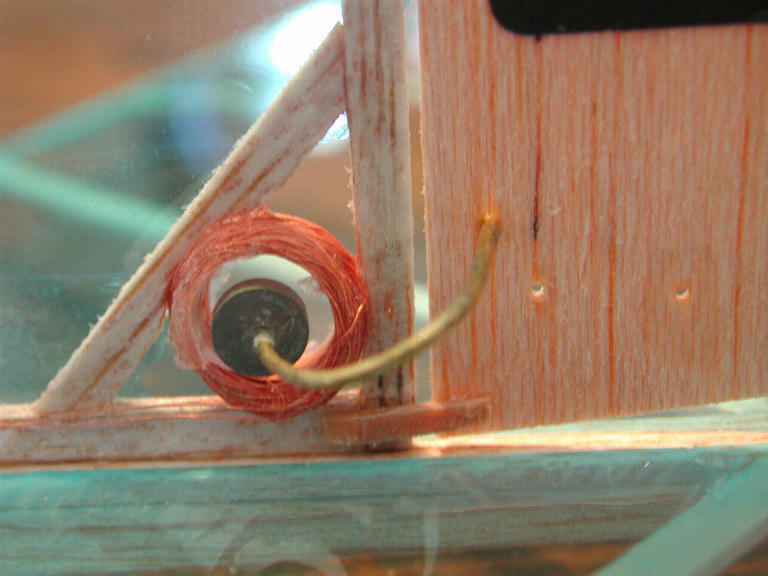 CA one magnet onto some copper or brass wire and bend it into a curve so that as the rudder moves the magnet can pass through the coil. Position the magnet 1-2mm to one side or the other of the coil. Voltage passing through the coil will repel or attract the magnet. 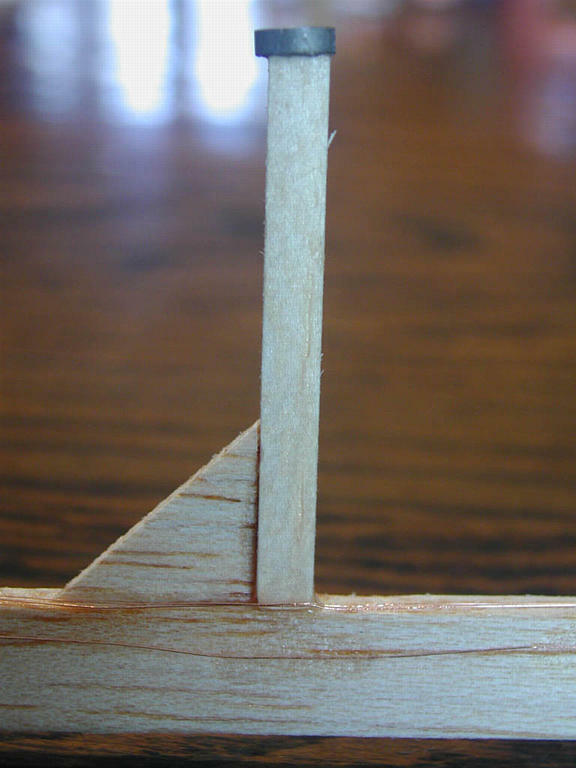 Mount your rudder on hinges that will pull it back to straight when no power is applied. I used small bits of elastic bands. Run the fine wire back to the reciever. 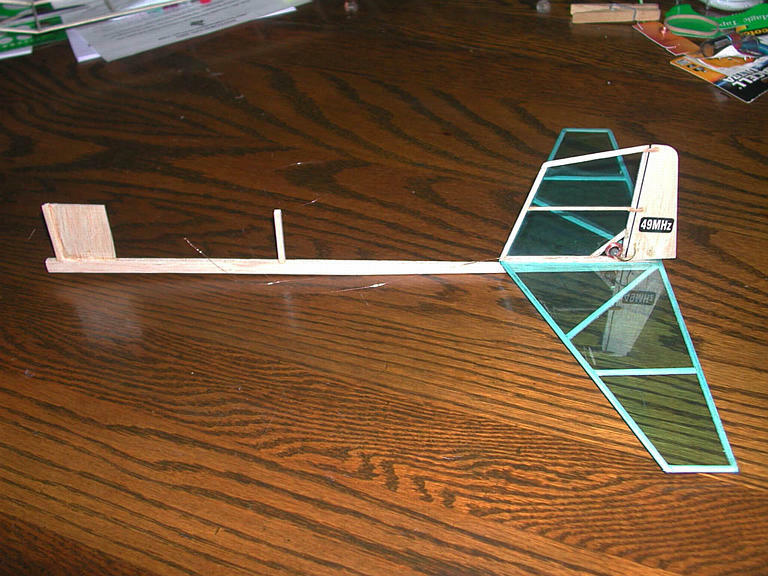 CA it to the top side of the fuselage so it can't get damaged. 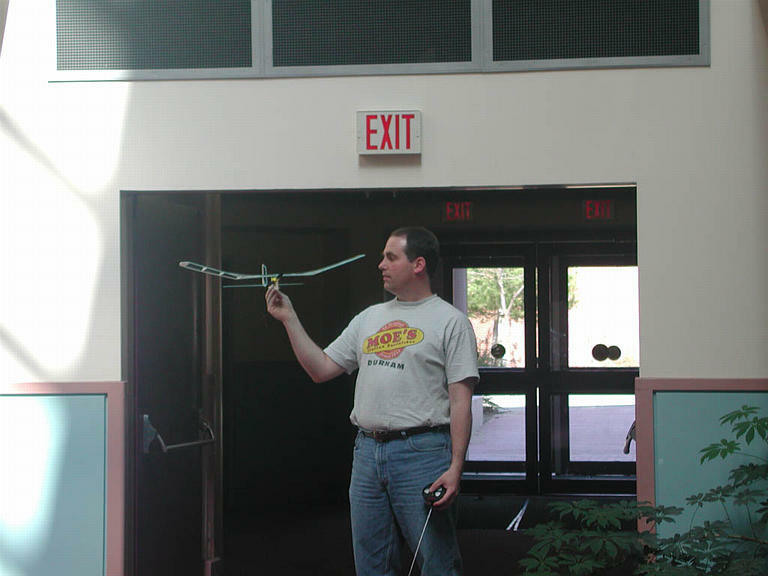 While you're doing this if you run an extra piece of wire you can use that for an antenna for the radio. 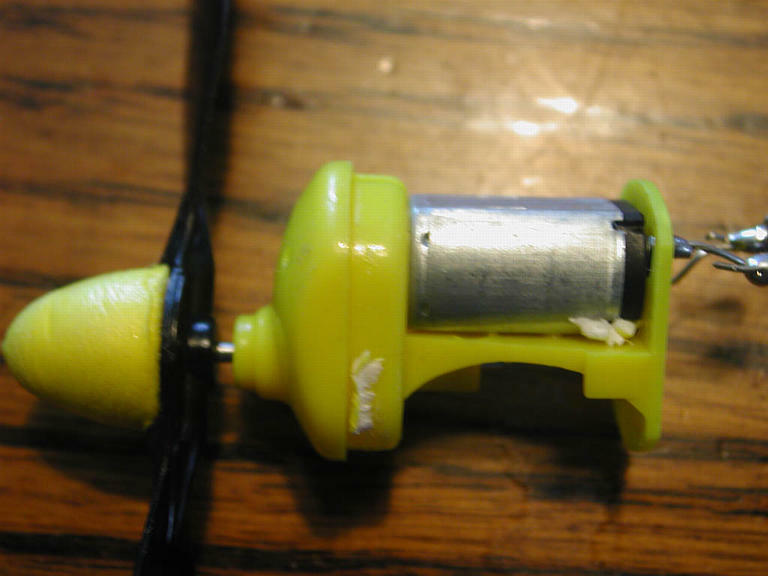 Don't forget to scrape the enamel off the wire before twisting it to the receiver leads. The wire is too fine to solder so I taped the leads down once twisted together. 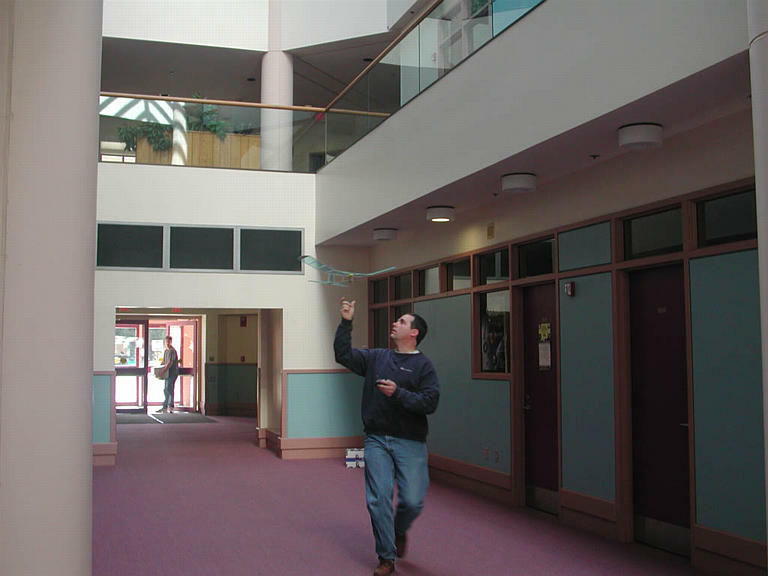 Testing this configuration provided the motion shown in the movie above. Here's where my expertise is thin. 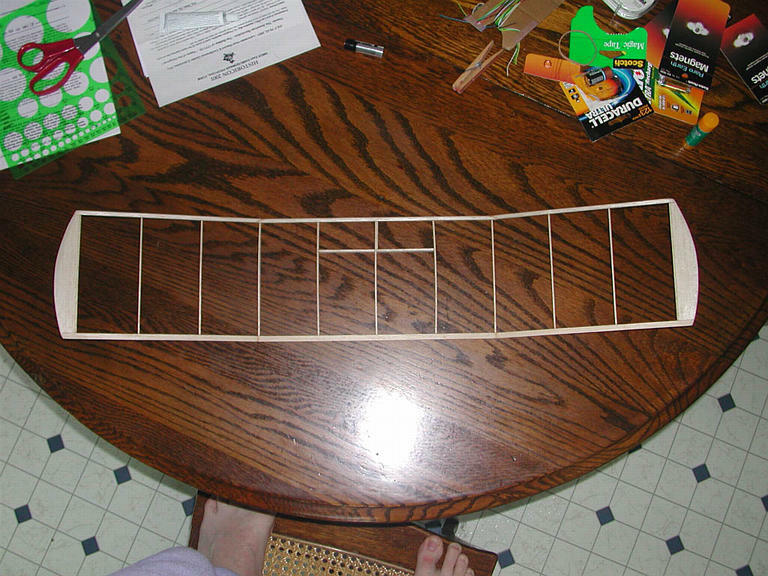 Drawing from the resources available I took the Flying Aces Stick wing from plans at rcmicroflight.com and enlarged it to 125% giving me a wing with 30" span. 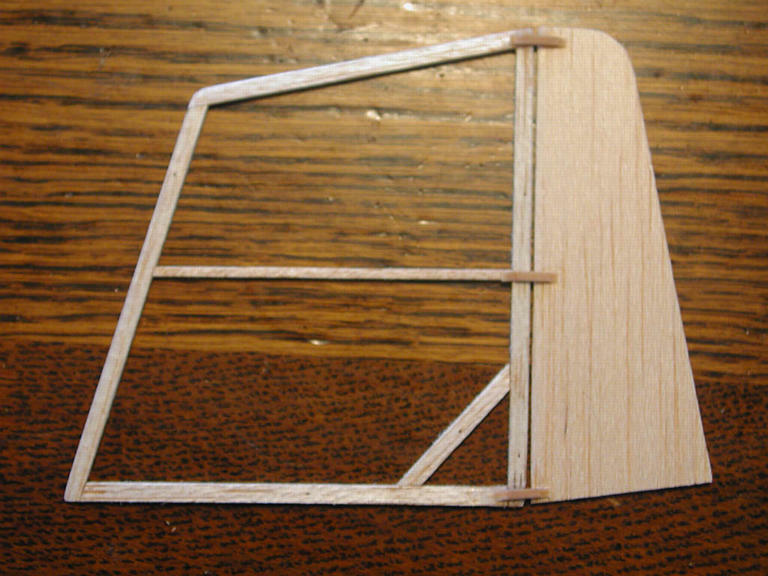 I constructed the wing from the same or smaller dimension wood where I thought I could get away with it. I didn't want to laminate the tips so I built them from 1/16 sheet. All flying surfaces were covered on one side only with Crystal Renolds Wrap attached with 3M Artists Mount spray adhesive. 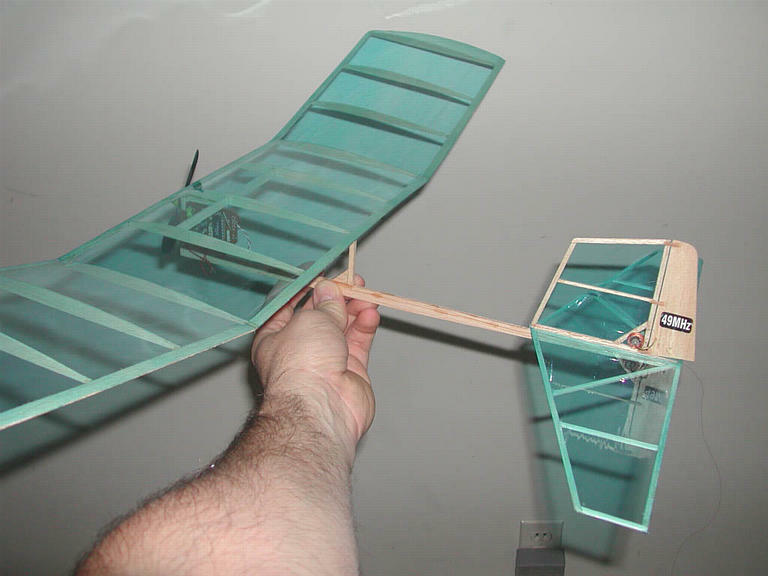 The wing was mounted to a 'Cloud 9' fuselage which was mentioned in the April 2000 issue of RC Microflight. The tail and elevator surfaces were built to a size that "looked right". 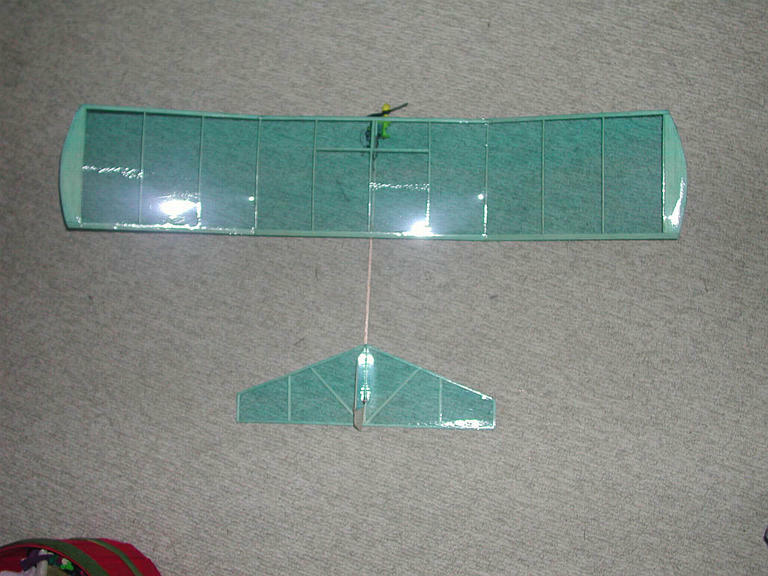 Instead of directly gluing the wing on I used pairs of rare earth magnets one on the fuselage and one on the wing at each mounting point. This makes the wing come off in a crash or to transport but hasn't failed in air. 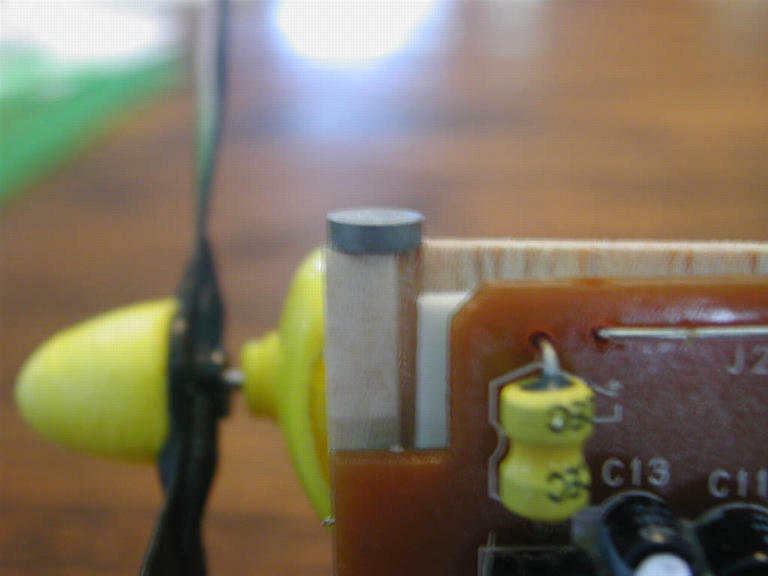 The motor and radio are affixed to the pylon with foam double-sided tape. The Duracell CR-2 Lithium battery is also affixed this way and tiny squares of foam tape hold the leads on. 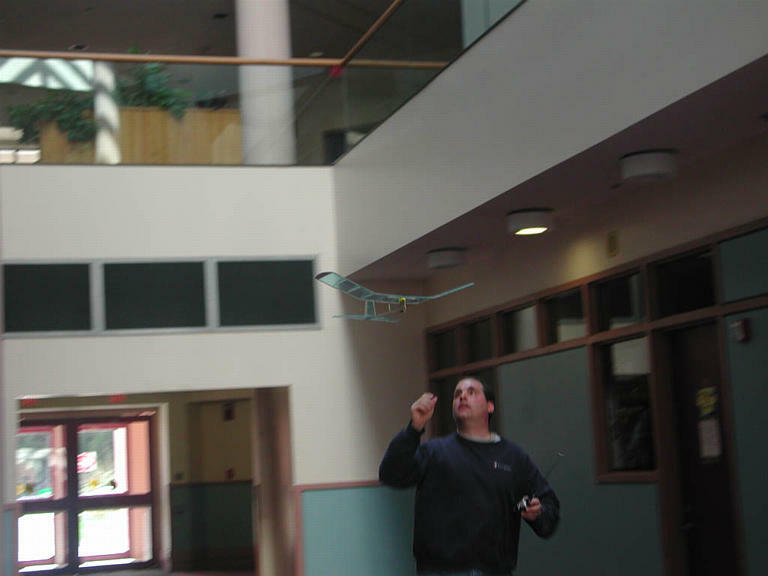 I went to the building where I work and tried some flight tests which I got photos of. 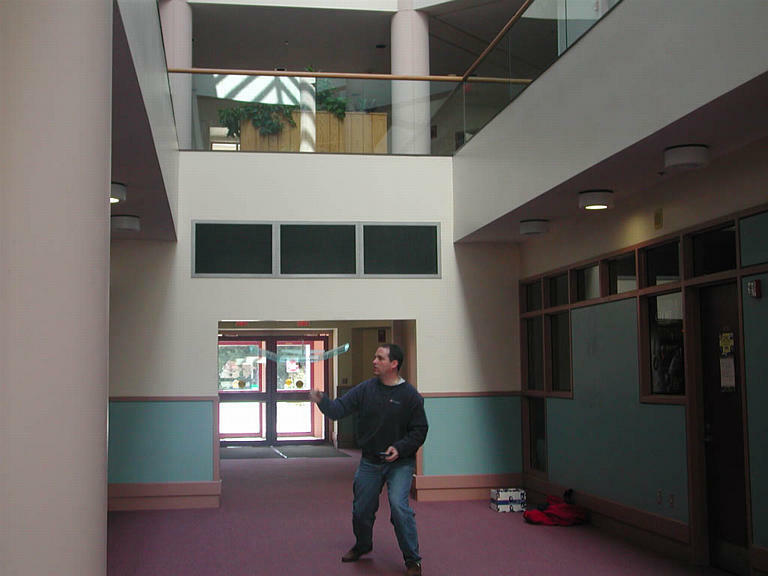 Unfortunately the hallway was too short and narrow so I then went to a gymnasium to finish tests. 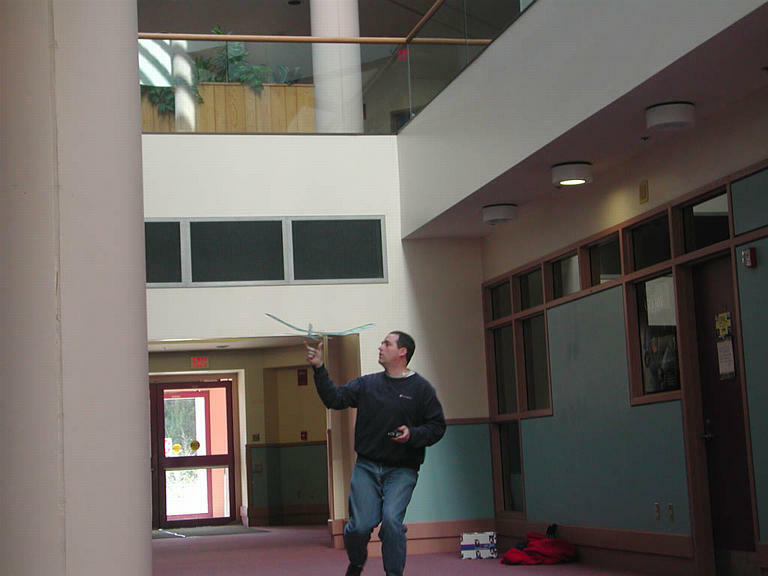 The quicktime movies at the bottom of this article show some powered flights. A bad crash at my first test site knocked out my rudder control so I was restricted to do left hand circles and just work on the trim for level flight for the remainder of my test flights. 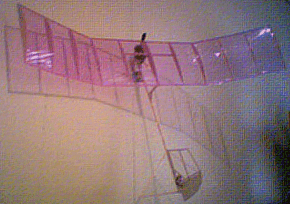 Not being a very experienced R/C flyer trimming the plane proved difficult but some of my flights proved to me that the thing CAN fly. I'll enlist the help of a experienced friend on my next outing. More in flight movies coming after my next set of trials. Re-covered wing - the first try the ribs at the dihedral joints came loose and the covering spaned across 3 ribs reducing the effectiveness of my airfoil.